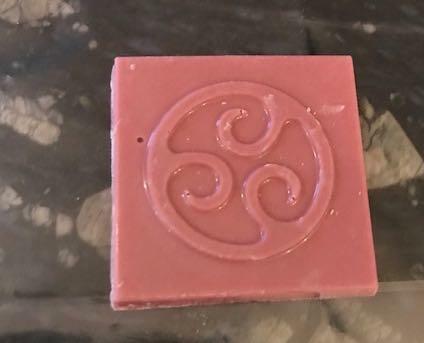 I’m late to this news but have just seen film of the ‘private’ launch of Ruby chocolate in China that took place recently. The Callebaut Rep was adamant that his samples were ‘bean to bar’ and that only 5 people in the world are aware of the source of the beans that produce Ruby chocolate and the production steps necessary. Yeah right - or using an old expiring patent before someone else does! I've been eager to try this, but when I saw that they only sell it in 10 kb bags for now it's like, meeeh, how about no? Maybe they'll sell the 2.5 kilo bags they've been throwing around, when it's available in more countries. I have tasted the Ruby chocolate! I will leave you in suspense until this evening when I get home from the bakery show. When you do tell us, make sure to let us know if they divulge a %cocoa solids or other info about the stuff... I'm interested to know if the ruby thing is a concentration of solids thing so it can only come in a very limited range of % or if it is a processing thing and you can get ruby from 30-80% like other chocolate types. Looks like it's a single formulation at this point - specs. This is the single piece that I have for tasting. Smell was only slightly chocolatey - more biscuit like, a bit fruity. Taste - slightly sour, grain/cereal, again biscuity, and a bit fruity - leaning towards the yellow and dried fruits. I must say I didn't hate it - it doesn't taste like chocolate - but it is quite pleasant. I think I could enjoy playing with it to make some tasty things. It sounds like the formulation I tasted in January had a similar profile, I think. I wasn't very excited by it - slightly acidic, but fruity, the closest thing it tastes like to me is white chocolate with berries. 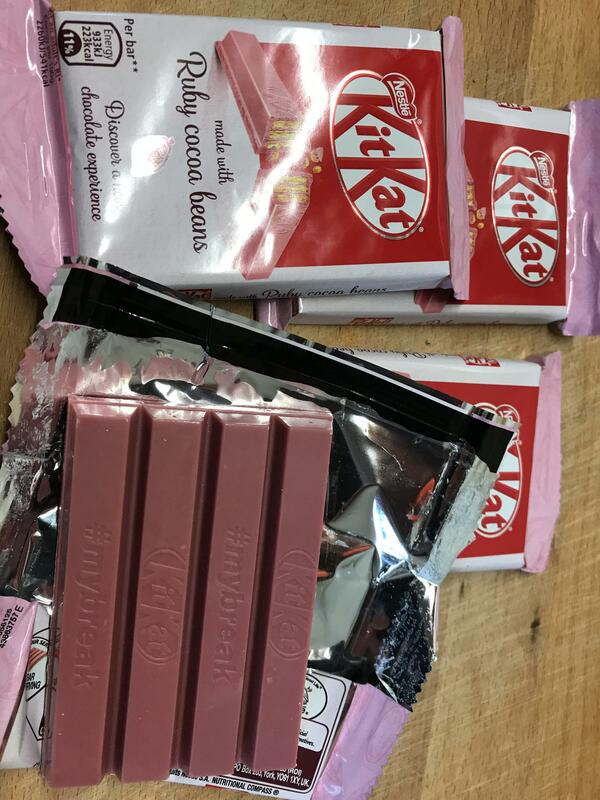 Ruby KitKats have been tracked down and eaten! While this didn’t give us the opportunity to properly evaluate the taste of the chocolate I would second @Kerry Beal‘s impression. A nice enough biscuit but I wouldn’t whip my cat across a field of broken glass to get hold of another (not that I need to, plenty of stock at Tesco)! but it also does not seem to indicate food coloring. 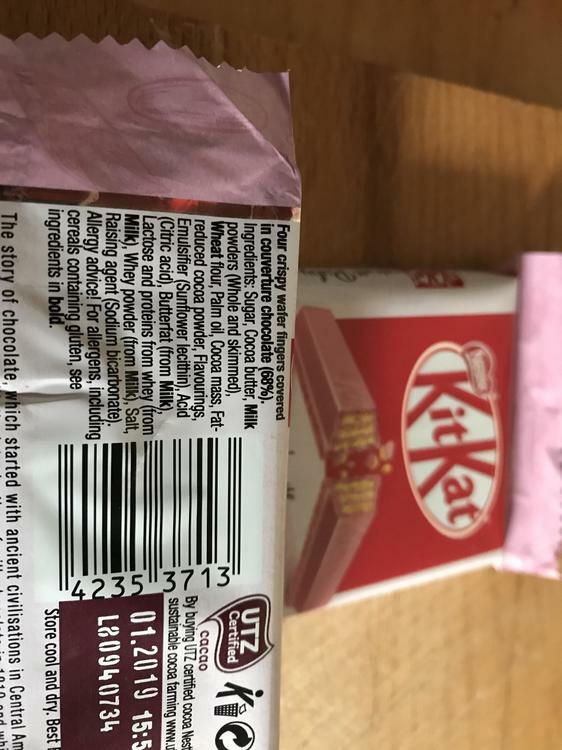 if you look at a regular KitKat, it won't say chocolate in the ingredients list either, I imagine. "Cocoa mass" is the pink ingredient in this case. "Four crispy wafer fingers covered in couverature chocolate (68%)"
"Cocoa mass" is the pink ingredient in this case. Cocoa mass is pretty far down the list. I'm surprised that milk powders are the third ingredient. There can't be more milk in the wafers than wheat flour, so is ruby actually a milk chocolate? 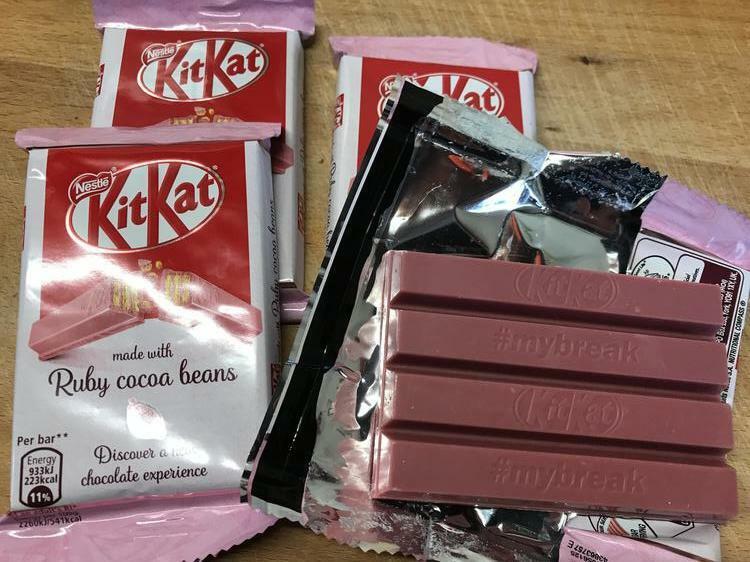 Or a milk chocolate for KitKat, at least? So the kit kat is 32% crispy wafer fingers and 68% chocolate, which is 47% cacao milk chocolate? Hard to say exactly how they are assigning ingredients - kind of looks like they are taking the whole thing - chocolate and filling - and breaking it down by highest to least percentage. No, the cacao solids are pink rather than brown. Maybe it starts out more ruby colored before they add white milk and sugar that dilute the color. 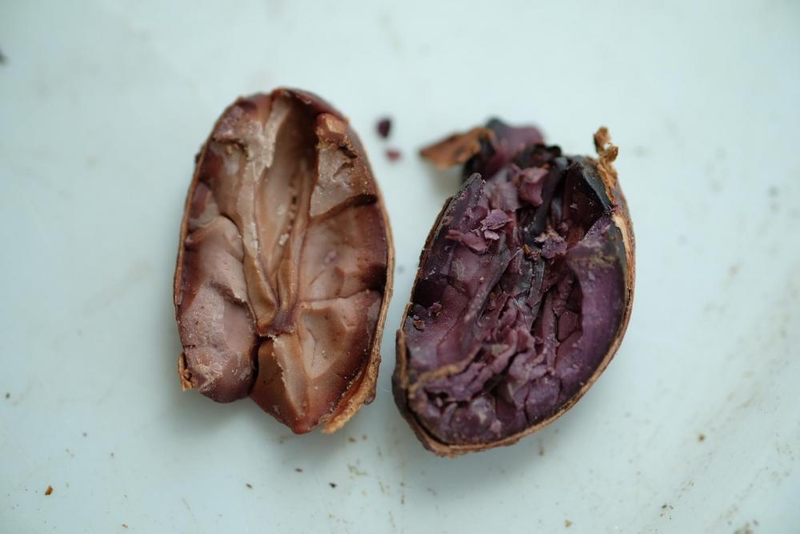 Cacao butter is off-white once separated from the rest of the bean. 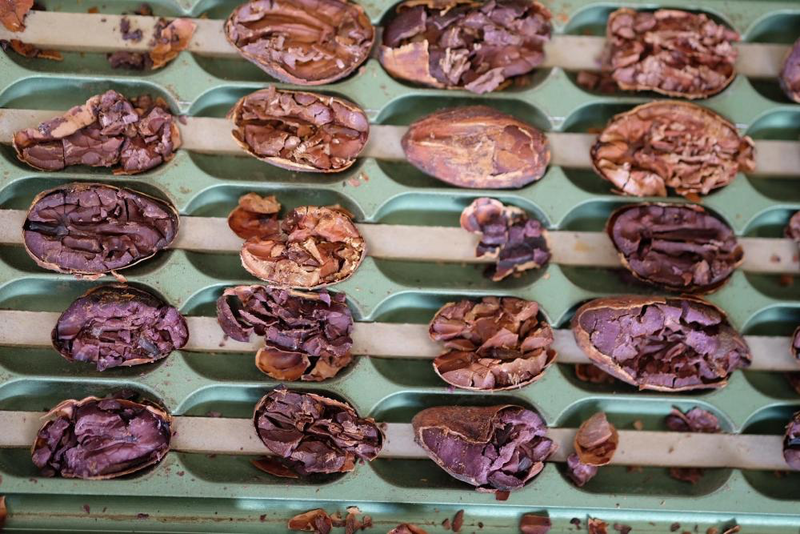 Have a look at these split cocoa beans - notice how purple some are vs others. 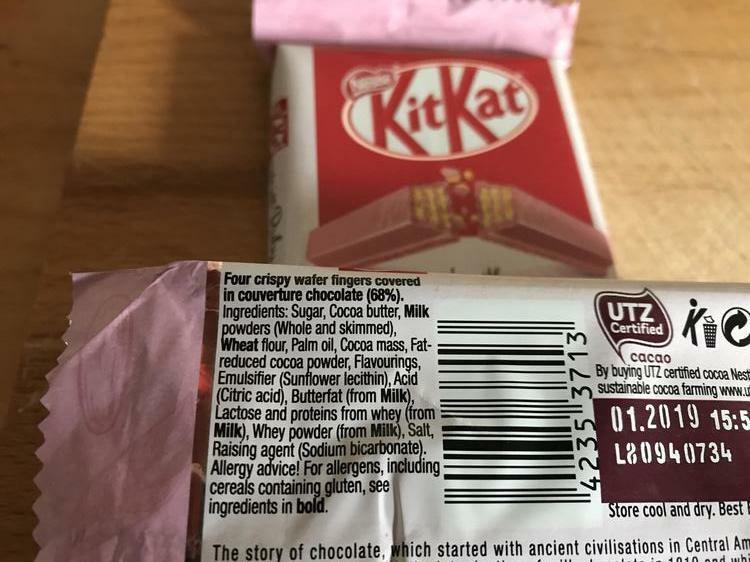 I believe this is what was noted in some beans that had been exposed to acidity before roasting that led to the patent that resulted in Ruby chocolate. 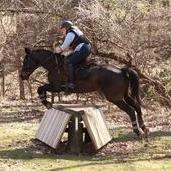 These pictures are from Soma when we toured at the 2016 workshop. This stuff just does not sound delicious to me. Full disclosure, I love dark chocolate, I like a few milk chocolates but will always choose dark over milk, and the only things I think white chocolate is good for are fruit-flavored ganaches and decoration.